Republicans on Monday evening unveiled their long-awaited plan to repeal and replace the Affordable Care Act. 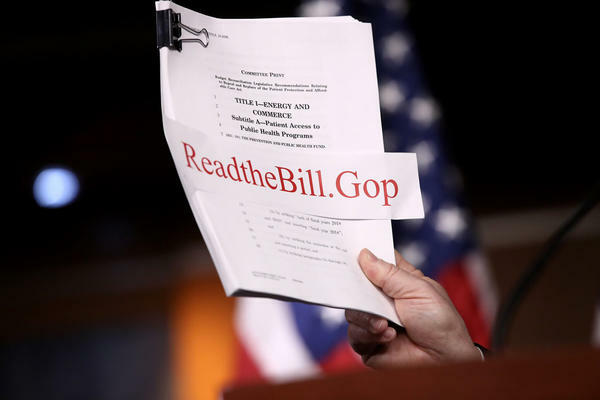 Some conservative Republicans have derided the new proposal — the American Health Care Act — calling it "Obamacare Lite." It keeps intact some of the more popular features of the ACA, such as allowing adult children to stay on their parents' health plans to age 26 and, at least in theory, ensuring that people with pre-existing conditions will still have access to insurance. In some cases the elements of the law that remain are due to political popularity. In others, it's because the special budget rules Congress is using so Republicans can avoid a Senate filibuster do not allow them to repeal the entire law. But there are some major changes in how people would choose and pay for health care and insurance. Here are some of the biggest. Both the GOP bill and the ACA provide tax credits to help some people pay their premiums if they don't get insurance through work or government programs. And in both, the credits are refundable (meaning people who owe no taxes still get the money) and advanceable (so people don't have to wait until they file their taxes to get them). But the GOP's tax credits would work very differently from those already in place. Under current law, the amount of the credit is tied to a person's income (the less you earn the more you get) and the cost of insurance where you live. The GOP tax credits would be tied largely to age, with older people getting twice as much ($4,000 per year) as younger people ($2,000). But the Republican plan would also let insurers charge those older adults five times as much as younger adults, so even a credit twice as big might not make up the difference in premiums. The GOP credits also do not vary by location, so they would be worth more in places where health care and health insurance are less expensive. The biggest changes the Republican bill would make are to the Medicaid program. Starting in 2020, it would roll back federal funding for the ACA's expansion that allowed states to provide Medicaid coverage to all low-income individuals under 138 percent of the poverty level, rather than just the specific categories of poor people (children, pregnant women, elderly, disabled) who were previously eligible. Thirty-one states opted to expand access to Medicaid. People who are covered under the expansion would continue to be funded by the federal government after that, but states would no longer be allowed to enroll anyone under those expanded criteria. And an enrollee who loses eligibility for the expansion program could not re-enroll. But the bill would go further as well, making changes to the underlying Medicaid program that House Energy and Commerce Committee Chairman Greg Walden, R-Ore., described as "the biggest entitlement reform in the last 20 years." "Capping federal contributions to the Medicaid program will likely force states with already tight budgets to limit eligibility and cut benefits to at-risk Americans," said the American Public Health Association in a statement. First, it would repeal almost all of the taxes that were increased by the ACA to pay for the expansion of health coverage. Those include higher Medicare taxes for high-income earners, a tax on investment income and various taxes on health care providers, including insurance companies, makers of medical devices and even tanning salons. The bill would also provide new tax advantages for those who can afford to save, including allowing more money to be deposited into health savings accounts, and lower penalties for those who use those accounts to pay for nonmedical needs. In addition, the plan would lower the threshold for deducting medical expenses on income taxes and allow people with job-based tax-preferred "flexible spending accounts" to put away more pretax money. It would also restore over-the-counter drugs as eligible for reimbursement from those accounts. The GOP plan doesn't actually repeal the requirements for individuals to have coverage or for employers to provide it. That's because it can't under budget rules. Instead, the bill would reduce the penalties in both cases to zero, rendering the requirements moot. The individual requirement was used by the health law to force healthy people into buying coverage to help improve insurers' risk pools since they could no longer bar customers with pre-existing conditions. Instead, the Republican plan would provide a penalty for those who do not maintain "continuous coverage." Those with a break in insurance coverage of more than 63 days could still purchase insurance without regard to pre-existing health conditions, but they would be required to pay premiums that are 30 percent higher for 12 months. The employer "mandate," which requires firms with 50 or more workers to offer coverage or pay a fine, has actually had relatively little impact on insurance coverage, analysts have concluded, and probably is not necessary to prevent employers from dropping coverage. In both the ACA and the GOP bill, however, workers whose employers offer coverage could not decline that coverage and get a tax credit instead. With all the taxes and fees stripped from the ACA, how will Republicans pay for their tax credits? The answer is not clear. "We are still discussing details, but we are committed to repealing Obamacare and replacing it with fiscally responsible policies that restore the free market and protect taxpayers," said the Republican fact sheet that accompanied the release of the bill.